We need trees! Throughout our neighborhood’s parkways, many trees are being lost to Emerald Ash borer, wind and weather, sewer, water and gas repairs, as well as old age, and we must replace them. Thankfully our neighborhood is up to the the challenge of planting new trees. Everyone has a role to play, individual homeowners can request a tree for their parkway from the City of Chicago, but the wait is usually years not months. To fill this gap, we are taking collective action with our multi-year Tree Planting Project. 2019 Ravenswood Manor Parkway Tree Planting! We have the opportunity to once again spruce up our tree canopy as we partner with the Openlands Tree Grant Program. We hope to replace some of the older trees that have been lost to storms, age, or insect damage, and also add trees to open parkways. Through this program, we have planted more than 70 trees in recent years. 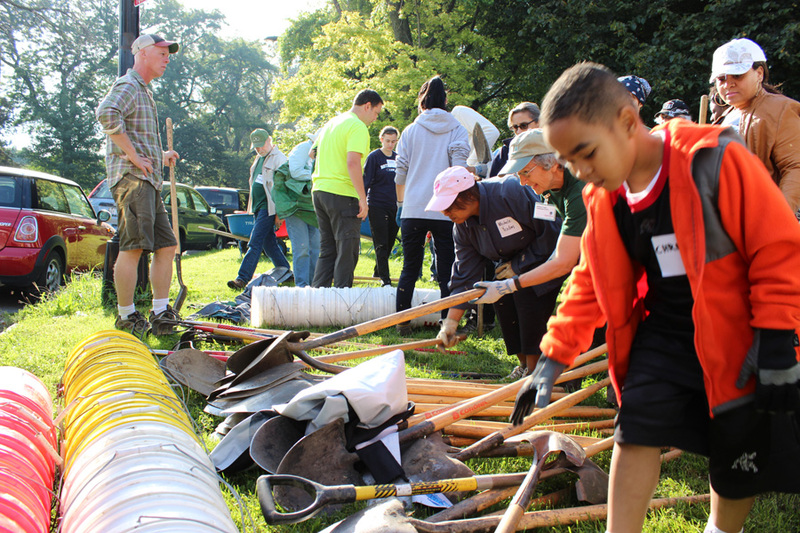 We need neighborhood residents to help identify potential planting locations, and to co-sponsor the tree planting. If you would like a tree planted in your parkway this coming Fall, please contact us at trees@ravenswoodmanor.com. After application to Openlands for the grant, and if we are accepted, the community tree planting will be on a Saturday in September or October. We will need everyone to come out to help dig, move mulch and plant our trees. 1. Contact us at trees@ravenswoodmanor.com soon, but BEFORE June 1, 2019. 2. Cost is $100. This includes the delivery of the tree along with the Openlands team supervising the installation. If you are over 65, please contact us. RMIA will help with part of the cost. 3. Agree to be home on the day of planting, if at all possible. If you cannot be home, the planting team will need access to water. 4. We need 20 trees to be eligible for Openlands to manage and oversee this project. Please consider joining us for this planting! 5. The planting will take place on a Saturday during the months of September or October. Once our project is chosen and approved by Openlands, we will receive our planting date. Fall 2017 planting day was Saturday, September 23. 21 trees planted. RMIA contributed $600 to assist homeowners. Fall 2015 planting day was Saturday, October 10th. 20 trees planted. RMIA contributed $1000 to assist homeowners. Fall 2014 planting day was Saturday, November 15th. 14 trees planted. RMIA contributed $700 to assist homeowners.